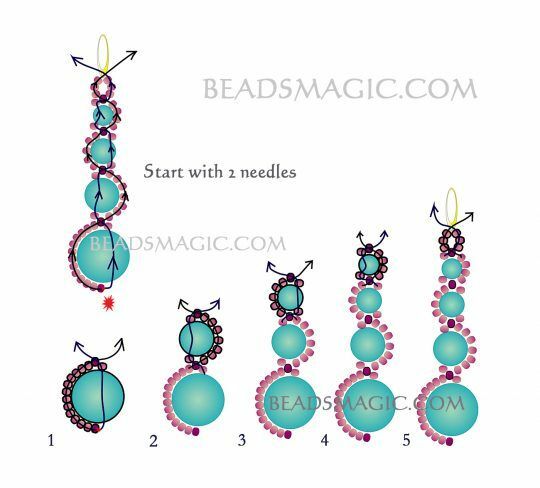 Here’s a simple beading pattern by for some earrings that anyone can make with just a few beads – not just a few in number, but only 2 types required. They’re a nice swaying type of earring that incorporates a simple but effective geometric pattern. Nice work, BeadMajic. Whether your a beading expert who just wants something fun and easy to do in a few minutes, or a beginner who really needs a simple beading tutorial (and a free beading tutorial) or they will just be overwhelmed, this beaded ring will definitely do the trick! For most beaders, each bead ring will take about 10 minutes to make, and they take very minimal materials! All you need for these beaded rings are: Your thread plus one needle; then you add your beads in this pattern: 1 gold, 2 white, 2 gold, 2 white, 1 gold (or you might be using different colors, too). Once you have one set of these beads, you loop them and tie them, and then cut off your excess string. When I was little, we spent quite a bit of time in the car. Some of it was for my parents’ job, some because our relatives were spread out across the U.S. from California to Florida, and sometimes we just wanted to go on a road trip. I always brought things with me to keep myself occupied, although what I brought changed with the years. First it was toys, then books, then a Discman, and eventually, I learned how to do a variety of crafts, including crochet, cross-stitch, and beading. 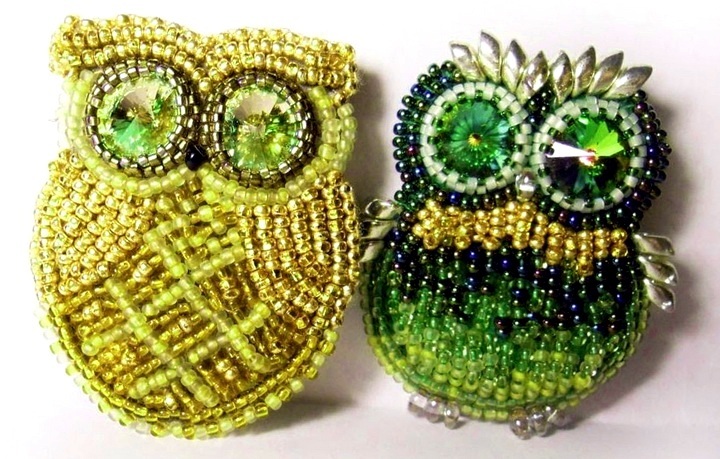 My friend Lydia was the main inspiration for my desire to learn beading. Art came intuitively to her, and often in forms that were arranged inside the dollhouse she’d designed. I still have two beading projects she made and gave to me – a beaded mat with a butterfly pattern for my own dollhouse, and a journal that she hand-sewed and beaded painstakingly together for a school assignment. 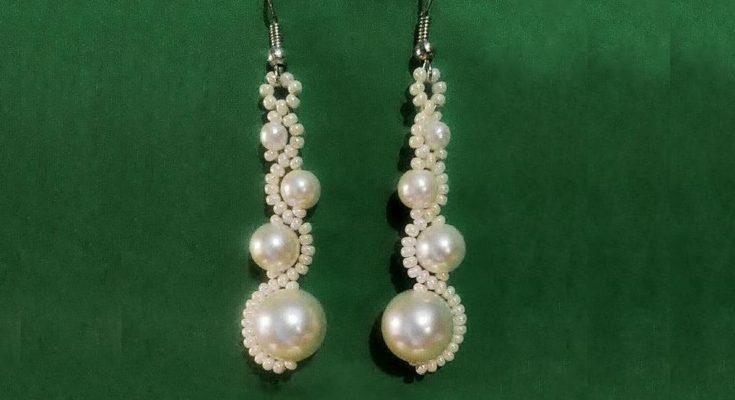 If you think of beading as something for experts, or dedicated hobbyists, you may want to check out a few books from the library, or watch a few videos on YouTube, like the one below. Beading is an enjoyable, meditative craft that requires few materials and whatever time you have available. It’s a craft you can keep coming back to over a period of weeks, months, or even years. To start your own beading adventure, you’ll only really need the following items: fishing line (later you can graduate to wire, elastic, or leather), beads (pony beads, seed beads, and wooden beads are great for beginners, but if you’re feeling fancy you can always order glass, porcelain, or metal beads later), scissors, felt, thread, and a needle. Depending on your project and pattern, you may also need leather, cardboard, tracing paper, a pencil (chalk, soap, or charcoal also work), safety pins, and either a toggle and clasp (useful for necklaces, anklets, and bracelets), brooch backings, earring hooks, and glue. You can also substitute for what you don’t have with handy kitchen tools like wax paper and tinfoil, skewers, and rubber bands. You can also use other craft items such as rhinestones, feathers, crystals, chain, and magazines. Experiment and find which materials work best for you. What you’ll want to do first is find a simple pattern to transfer onto your backing, which should be firm enough to hold plenty of beads without drooping. Then you’ll choose your beads and get to work sewing them onto the backing. You can also add buttons, fabric, lace, or other standout objects to the brooch with glue. After you’re done sewing the beads on, attach a brooch pin. You’re done! 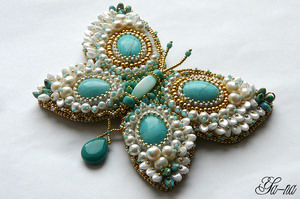 Interested in trying out a beading pattern? This brooch on YouTube is fun, but if you’d rather go for something inspired by nature, you can try the instructions found on Podelki (Google does a pretty good job at translating the page and the instructions, but there are also plenty of photos with step-by-step, simple instructions).